Dentists work to preserve natural teeth. When accident, decay, gum disease or other issue causes tooth loss, dental implants from Long Island City’s LIC Dental Associates help. Natural looking, feeling and functioning, dental implants are superior tooth replacements. Drs. Ishwinder Saran, Hayley Bindner and Steven Bizzell, dentists in Long Island City, see the need for tooth replacement after extraction or accidental loss. Even one missing tooth negatively affects the size and density of the gums and jaw bone, and teeth adjacent to a gap weaken and become misaligned as they drift into the empty space. 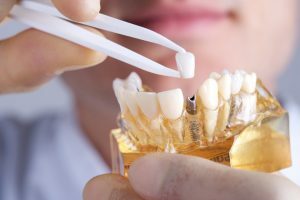 While traditional bridgework and dentures are fine as far as they go, they do not preserve the integrity of the jaw or gum tissue the way dental implants do. Ordinary tooth replacement choices simply rest on the gums; dental implants, however, reside in the bone and effectively strengthen it every time the individual chews or bites. Dental implants have this bone strengthening ability because of an amazing process called osseointegration. When your implant dentist in Long Island City surgically places one of these devices, the jaw bone actually fuses, or integrates, to it. The reason for this is that the implant screw is made from titanium. Years of scientific studies show that titanium and human bone bond together exceptionally well. In fact, orthopedic surgeons use titanium implants to replace arthritic joints such as the hip and knee. After the dentist determines that a person’s bone is strong enough and his gums healthy enough to receive a dental implant, he or she incises the gums and drills a small hole into the bone. The implant device is screwed into the jaw, the site is sutured closed and the implant is allowed to heal and integrate with the bone. After several weeks, the patient returns to LIC Dental Associates, and the doctor opens the site to attach a metal alloy post and custom-made porcelain crown. At this point, the restoration is complete. The patient goes home with an artificial tooth that bites, chews, feels and looks like a natural tooth. Dental implant placement succeeds more than 90 percent of the time, and the vast majority of implants stay in place for decades. The same benefits apply to multiple implants which support fixed bridgework or full removable or fixed dentures. To keep implant sites healthy, patients brush twice daily and floss every day to avoid accumulation of plaque and tartar. Just as with natural teeth, implant integrity is threatened by gum disease–called peri-implantitis, in the case of these artificial teeth. Also, the team at LIC Dental Associates asks implant recipients to come in for 6-month exams and cleanings. Smoking cessation aids in keeping dental implants, and all your oral health, intact and thriving. While dental implants cost more initially, they are more economical in the long run because they rarely need replacement. Plus, surrounding teeth better retain their shape and enamel integrity. Contact LIC Dental Associates to set-up an implant consultation. The dentist will explain your tooth replacement options. Your smile can be healthier, stronger and better looking with these outstanding dental implants.